Obama Helps 2014 Democrats One Way He Still Can — With Cash : It's All Politics While vulnerable congressional Democrats might politely decline a local appearance by President Obama on their behalf, the money he's raising for their campaigns is an entirely different matter. 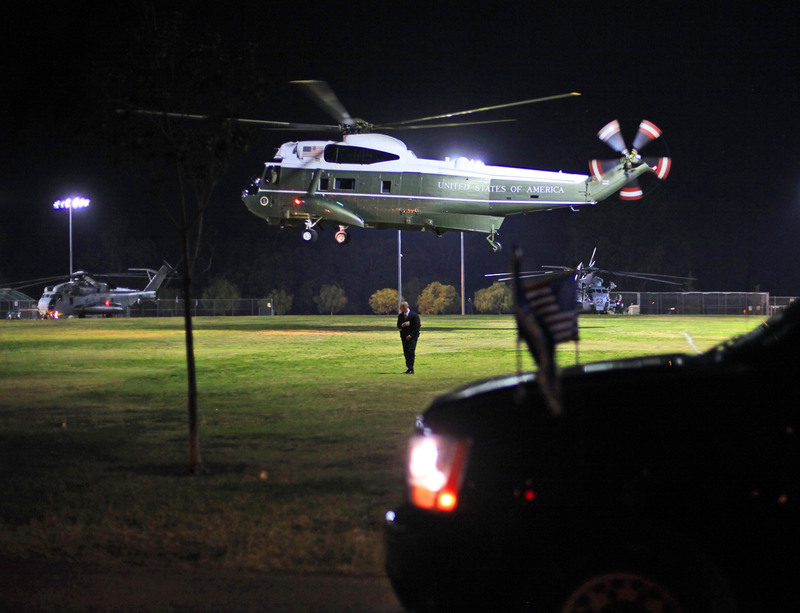 Marine One, with President Obama aboard, lands at a Los Angeles park on Monday as part of Obama's three-day West Coast trip that combined fundraising and official business. Should President Obama be as unpopular once the 2014 midterm campaign is in full swing as he is now, there are likely to be more than a few vulnerable Democrats who'd prefer that he stay as far away from their districts as possible. But the money he's raising for their campaigns is an entirely different matter. As former GOP senator from Texas Phil Gramm once said, an American politician's most reliable friend is "ready money." If Obama has anything to do with it, Democrats facing election next November will at least have plenty of help from that reliable friend. The president has been unstinting in his second term in performing the fundraising role required by his position as leader of Democratic Party. Just before Thanksgiving, Obama was back in California, raising bounteous political cash, including at fundraisers held at the estates of former basketball star Earvin "Magic" Johnson, where ticket prices ranged from $2,500 to $15,000; and entertainment mogul Haim Saban, where tickets were $16,200 per person. The money will go to the Democratic campaign committees for both House and Senate candidates. As far as such fundraising trips are concerned, Obama has lapped his two-term predecessors, and not by a little. "Although unable to run again for election himself, Obama is estimated to have raised up to $40m for other Democrats since his last inauguration in January as he devotes a growing portion of the second term to financing efforts aimed at winning back control of Congress in next year's midterm elections. ... George W Bush attended just 11 similar events, Bill Clinton managed 18 and Ronald Reagan only 10." That kind of devotion to getting rich people to write checks has helped the Democratic Congressional Campaign Committee outpace its Republican counterpart. The DCCC has raised $62.5 million so far in 2013, $10 million more than the National Republican Congressional Committee. Democrats once hoped Obama's aggressive fundraising would boost their chances of recapturing House control (that was always a longshot; even in relatively good times, few experts thought they could net the required 17 seats.) The Affordable Care Act's troubles now have House and Senate Democrats hoping to just keep what they have. That's especially true for Senate Democrats and their narrow majority. A net Democratic loss of six seats would flip control to Republicans. The present political reality for congressional Democrats is that they'll likely need every dollar the president can raise to overcome the headwinds created for them by the HealthCare.Gov fiasco and the health-plan policy cancellations blamed on Obamacare. Republicans have already signaled that Obamacare will be the turf much of their 2014 congressional campaigns will be fought on. "We are at an event here because we understand that part of our democracy, part of this amazing experience we're engaged in, is we gotta run around, we gotta raise money and we gotta make speeches. We gotta go to rallies and get folks fired up. We've gotta engage in the process. And that's a good thing, that's a healthy thing." So Democrats should have plenty of ready money if Obama maintains his current fundraising pace.